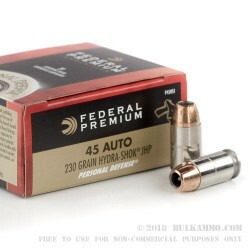 This is a top tier self-defense line from Federal and offers a hard hitting 230 grain projectile that is from the famous Hydra-Shok line that has a reputation for controlled reliable expansion and some of the best penetration on the market for this caliber and projectile weight. The premium components used in the manufacture of this ammunition shows with the inherent reliability of the line, from the Boxer primers to the nickel-plated brass that helps reliably feed the cartridge as well as mitigate friction concerns upon extraction. 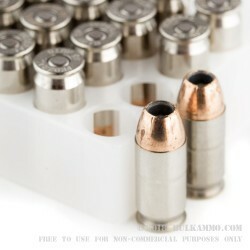 The reloadable brass stays corrosion resistant and the easy to clean nickel surface speeds reloading prep time. the clean burning powder is used because it is able to burn thoroughly and create less smoke at the muzzle, meaning you can get a faster follow-up shot; not only is it clean it has a reduced signature too. 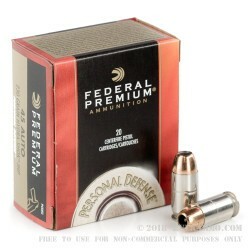 The low light conditions are affected by large muzzle flash – this line doesn’t have that problem as much as others thanks to this powder choice. Impressive ballistics from this load type look like this: 900 feet per second velocity at the mu8zzle and 414 pound feet of energy. Great reliable round for carry.